In 2016 the National Institute for Health and Care Excellence (NICE) published a guideline on oral health for adults in care homes in England. The author was a co-opted member of the NICE oral health for adults in care homes public health advisory committee. 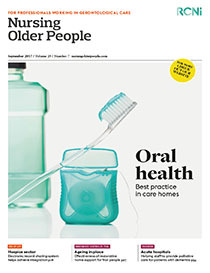 This article reviews the NICE guideline as it applies to care homes, and relates it to the results of a survey of oral care practice undertaken in a large care home organisation and the available research literature from the past 20 years. The literature and survey results suggest that, if translated into practice, the NICE guideline could do much to improve oral health for adults in care homes. The survey highlighted that 85% of residents required support from carers to undertake mouth care. It also found that care homes experienced significant difficulties in accessing dental services for residents. The author concludes that providers need to equip staff with the necessary knowledge and skills to undertake mouth care and to give this area of personal care greater priority. Finally, the author suggests that the Care Quality Commission could ensure that the NICE guideline is translated into practice in care homes.